My family isn’t huge on sweet treats, but Christmas time is treat time. We have a few favorites: an incredibly buttery butter pound cake that smells insanely delicious while baking, melt-in-your-mouth short bread cookies, and caramel corn, or as my mom likes to call it, poppycock. 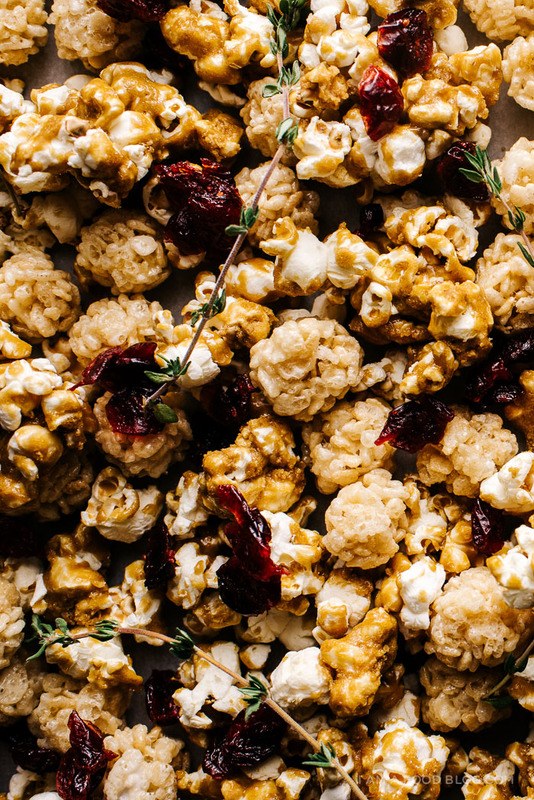 The caramel corn/poppycock is a fairly new addition to our sweet treat list. My mom got the recipe from a co-worker and I remember the first time we made it, it was more candied nuts than popcorn, mostly because my mom loves nuts. Here, I switched out nuts in favor of some tiny rice krispie balls that I like to think of as mini snowballs. I love the texture contrast between the crunchy caramel corn and the softness of fresh rice Krispies. Is there anything better than fresh rice krispies? I know you’re supposed to let them cool down so you can cut them into squares, but sometimes I’ll just eat that buttery marshmallow mixture right out of the pan, no setting needed. 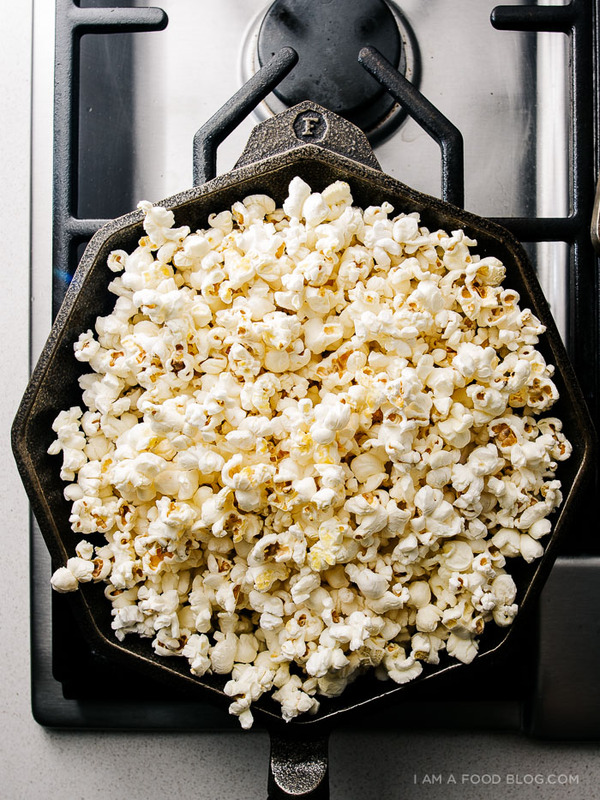 Speaking of pans, have you ever made popcorn in a cast-iron pan? It’s incredibly simple and a lot of fun. When I do it, it makes me feel like I’m chilling out in the olden days (the days before microwave popcorn). Maybe someone’s brought over some corn for popping and it’s snowing outside? Best Christmas-y feeling ever. Of course, I don’t think they had marshmallows in the olden days so maybe I wouldn’t be so down with it? I’m sure they had dried cranberries and thyme though, right? Because I also added some dried cranberries for a bit of tartness and some thyme for a bit of herbaceousness. Plus I loved the way it made this popcorn red and green without being too red and green. I’m totally getting in the spirit! 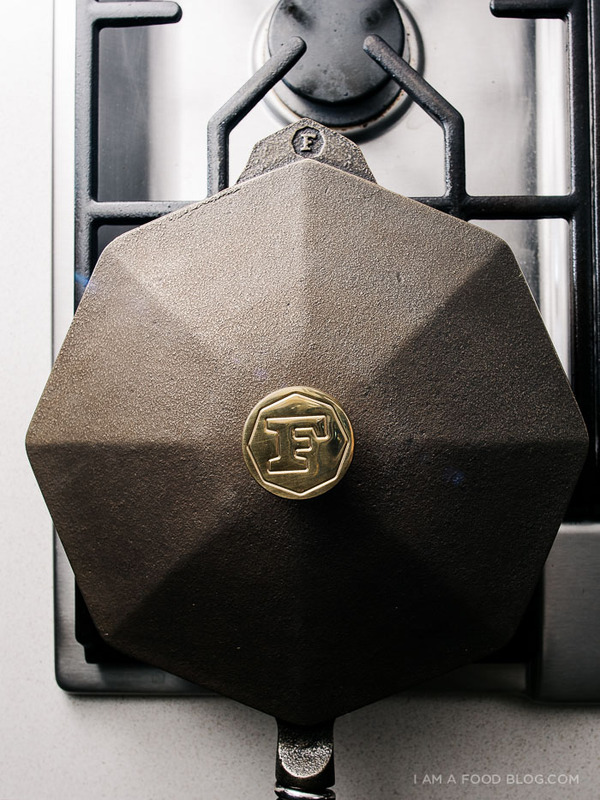 The Finex cast iron pan featured in this post is the four item in advent giveaway series! The pan featured is a 10 inch pan with lid and it’s my favorite size of all of the Finex pans. You’ll see Finex featured in my posts over and over again because they are one of my go-to cooking vessels. They have machined bottoms which make them extremely smooth and non-stick. And they’re made in America! If you win this guy, you’ll absolutely fall in love. I can’t wait to give one away. Only thing is, I’m not giving the pan away just yet. Check back here in a couple of days when I’ll announce the last giveaway item. It’s kind of like a little giveaway advent – there are five items in all and it’s a pretty exciting bundle! Make the caramel corn: Preheat oven to 200°F. Put popcorn in a large bowl and set aside. Combine the sugar, corn syrup, butter, and salt in a medium saucepan and cook over medium heat, stirring, until mixture comes to a gentle simmer, about 4 minutes. Stop stirring and continue cooking until mixture lightens in color, 5 minutes more. Remove from heat and stir in baking soda. The mixture will foam up, so be careful!Pour the caramel mixture over popcorn and working quickly, toss to coat. Transfer to a rimmed baking sheet and bake, stirring every 20 minutes, until almost dry, about 1 hour. 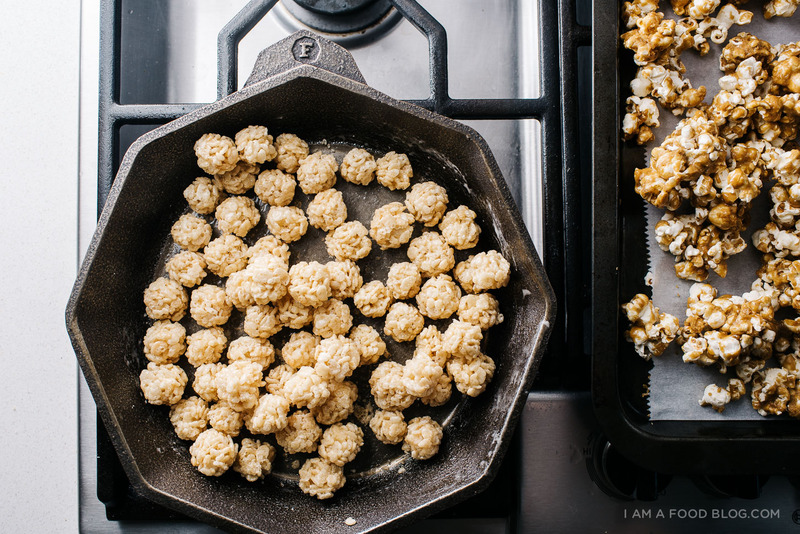 Let cool on sheets completely.While the caramel corn is baking, make the rice krispie balls. Melt the butter over low heat in a heavy bottomed pan. Add the marshmallows and stir until completely melted. Add in the rice krispies and mix well. When slightly cool, lightly butter your hands and shape into small balls. 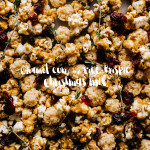 Toss the caramel corn and rice krispie balls together with dried cranberries and fresh thyme, if desired. Enjoy! If not eating right away, hold off on the cranberries and thyme, and add them when needed. 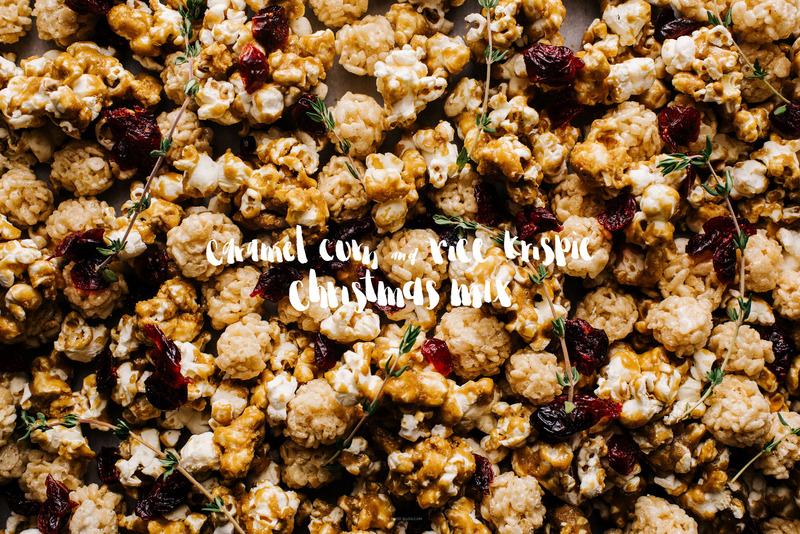 Note: Caramel corn adapted from Martha Stewart! Heat the oil over medium high heat. Add 3 kernels of popcorn to the pan and cover. Listen carefully for the kernels to pop. Add the popcorn kernels to the pan in a single, even layer. Cover and remove from the heat for 30 seconds to bring the kernels to a near popping temperature. Return the covered pan to medium high. The kernels should begin to pop shortly, all at once. When you hear almost constant popping, gently shake the pan, keeping the lid slightly ajar to let out steam so the popcorn stays dry and crispy. Once the popping slows to several seconds between pops, remove from the heat and remove the lid. Pour the popcorn into a bowl. Ohhh I love the addition of thyme, so festive! And those little rice krispie balls are just too cute..
this sounds awesome, but i’m mostly impressed by how clean your burners are. you don’t even want to see the state of mine. Oh my gosh, that shot of the caramel bubbling is jaw-droppingly beautiful. This caramel corn sounds SO SO GOOD, Steph!! soooo i just read festive as furikake. and given that i saw joy the baker’s furikake rice krispy treats yesterday, i was like, what is it with furikake and marshmallows?? have to say i’m glad this one doesn’t have furikake. ANYWAYS, love the little rice krispy balls! they definitely make this mix more holiday worthy, and i can’t help but think how adorable they’d be on a baby christmas tree. Festive indeed!! What a gorgeous mix! This reminds me a lot of a caramel Cheerios snack that Mom has been making every holiday into forever. And it also reminds me that it’s time to make some this week- STAT. We are obsessed with snack mixes especially around this time of year! 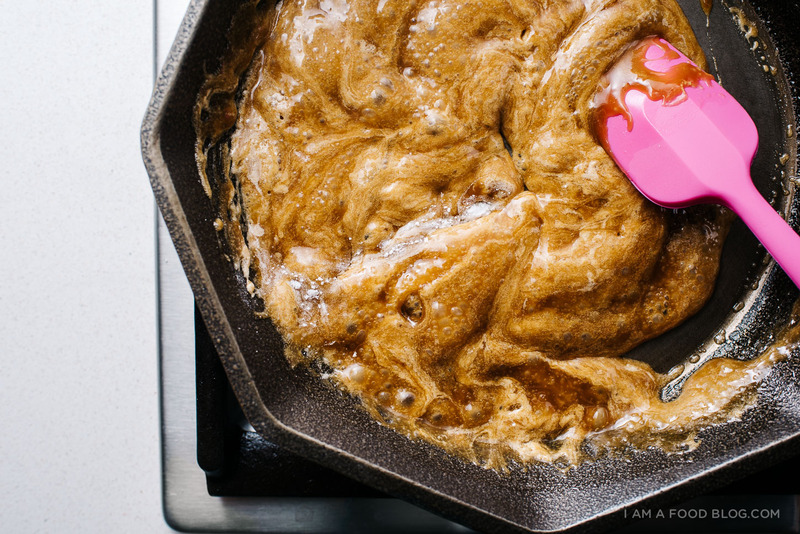 Making this in a cast iron pan is such a great idea! Love the cranberries and thyme! Such a simple, easy recipe, with outstanding results. These would definitely go down a storm in our house. Thank you for sharing the recipe. Sammie. Oh my gosh, I need this in my life! You’ve combined so many of my favourite things into one amazing snack!!! This look so yummy! Can’t wait to try it out! I love your pot, where did you get it from?